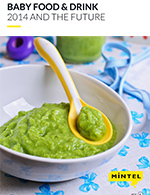 This global annual market overview will provide you with an in-depth review of the key issues in the global baby food and drink market through 2014 as well as our forecast for what will happen in 2015 and beyond. The value of the Chinese baby food and drink market doubled between 2009 and 2014. Growth prospects are very promising as a nationwide relaxation of the one-child policy could lead to an extra 1 million newborns per year, on top of the annual 16 million births. Innovation continues to be buoyant. However, baby food manufacturers are focusing on different sub-categories. Over one in four products launched in 2014 was an infant milk/formula, compared to one in four in 2010. Manufacturers have brought to the market an increased share of baby fruit products, desserts and yogurts and snacks. In baby food and drink, excluding milk/formula, naturalness remains the major platform of innovation with nearly six in 10 of the products launched in 2014 featuring a no additives/preservatives claim and approximatively half of them being organic. Nestlé remains the global leader and the most innovative company. Nestlé is responsible for over one in seven new baby food and drink products launched globally in 2014. It is followed by the market challenger, Danone, which accounted for one in 10 new products.